Friendly staff. 10 minute walk from Khao San road. 3 minute from 7 eleven. Very nice breakfast. Excellent value for money hostel 5 minute walk from the top of Khao San Road! Dorms were stylish and comfortable. Bathrooms were clean and well maintained. Free breakfast was great. Thanks! Everything was good but you should take your own towel, I had to wait more than 24 hours for them to bring clean towels. 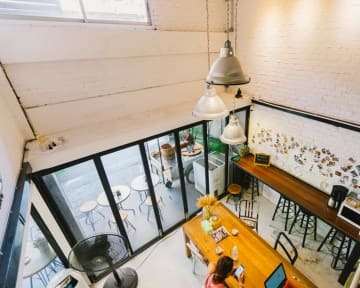 There are 2 3HOWw hostels in Bangkok, the modern photos advertised for this hostel are actually of the newer hostel in a different part of Bangkok! The rooms could do with updating, no curtains on the beds, no reading light on our bunks (although some had a reading light). The room was quite small also. The aircon is not on during the day so it can get a bit warm if you are jet lagged and in need of an afternoon nap! The staff were very nice. Good location, 15 minute walk to Koh San Road. Overall great place to stay. You can keep to yourself, or mingle with other travelers. Breakfast was great with the mini fried eggs in addition to the usual toast/jam/butter. Great location near Khao San Road next to all the other hostels too. Did not enjoy my stay here. The price is reasonable but I've stayed in far better hostels for the same or less. The bed was very rocky, even rocking when people walked on the floor! The ladder to the top bunk was falling off, meaning I nearly fell every time I tried to clamber up or down! The bed sheets were stained and bathrooms smelled of stale pee. The location is okay and close to khao san however, is down an alley which can be unnerving when by yourself. Staff were helpful. I am a regular customer of 3 Howw hotel ( the other one in Bangkok) .. what a deceptive moment when I saw the reception and the location.. not at par with 3 Howw hotel.. while I was waiting for my room at the reception I spoke with 3 guests and they all said the place was dirty.. I immediately left and move to an other hostel.. too bad you were my reference in term of Joao.. but this one kills it. At first I was in a female dorm room which was really good but I extended and had to move to another room what was no problem but the room was awful! The aircon was repaired but it still dropped the whole time and in the night I woke up because I felt itchy everywhere and I found a bedbug and went to the reception and he only gave me a new room but that was all! No refund my laundry was washed but just on demand and without washing powder so it was the worst service I had in 3 months travelling!